ST. PETERSBURG, Fla. — Constant interruption. A condescending tone. Eye-rolling. For many women, the presidential debate between Hillary Clinton and Donald Trump was a case study in deja vu. For more than 90 minutes on a national stage, they said Tuesday, Trump subjected the first female presidential candidate from a major party to indignities they experience from men daily, in the workplace and beyond. In the course of the debate, Trump interrupted Clinton 51 times, while she interrupted him 17 times. Kathleen Hall Jamieson, a professor of communication who is director of the Annenberg Public Policy Center at the University of Pennsylvania, said Trump’s frequent interruptions of Clinton conformed with research concluding that men in group meetings interrupt women more than vice versa. Asked about the interruptions and whether Trump might change his style in the next debate, his spokeswoman Hope Hicks praised his showing. “Mr. Trump gave a stellar performance and showed a comprehensive understanding of the issues voters are most interested in including trade, economic development, and job creation,” she wrote in an email. Hillary Clinton and Donald Trump face off for the first of three debates. Who will win the night? Watch PBS NewsHour for the full debate, plus analysis from Mark Shields and David Brooks. The exchanges between the candidates underscored how different they are. 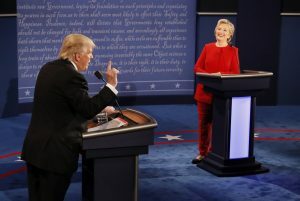 Unlike previous presidential debates, where there has been a thin veneer of respectful discourse between two men, this was a stark conversational divide. And, some said, a gender divide, one that’s all too familiar to women. Clinton’s deportment is of a piece with her experience as a Washington insider, first lady, and former secretary of state. But Trump, whose roots are in reality TV and the male-dominated construction world, has always had an in-your-face style — and not just with women, as others pointed out on Tuesday. At debates during the Republican primaries, Trump was far from mannerly in his treatment of his opponents, male and female. Jessica Light, a sophomore at the University of Toledo from Berea, Ohio, said Trump’s interruptions didn’t bother her: “She was being harsh and he was just standing up for himself,” she said. Others found his behavior at the debate to be unnerving. Trump reminded Deborath Calvanicoweinstein, a homemaker in Madison, Wisconsin, of the car repairmen who talk down to her, but not to her husband. Some said Trump was condescending from the start of the debate. At a debate watch party in St. Petersburg at The Queenshead bar, that remark was met with groans in the audience. “I think she looked great when she talked, and I think she looked even better when he talked,” said Trish Collins of St. Petersburg. For others, like author Tyler King of Orlando, the debate marked a moment when a highly visible woman turned a spotlight on something that’s been happening for eons. “Even if we don’t say it out loud, we share those looks across the conference table. We see it. And little by little, more women are reaching the limits of their patience and speaking out,” she said. Associated Press reporters Doug Glass in Madison, Wisconsin, John Seewer in Toledo, Ohio, and David Crary in New York and AP researcher Rhonda Shaffner in New York contributed to this report.